UNDER CONSTRUCTION – With the latest iOS versions Beemer Trivia may not allow games to start, so has been removed from the App Store. We hope to reintroduce Beemer Trivia with new features and questions in the future. 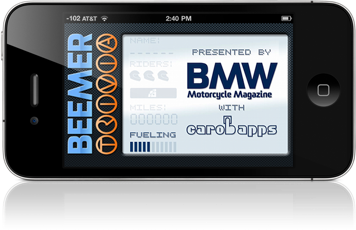 Beemer Trivia, for the iPhone, iPod Touch and iPad, is a trivia game designed by and for BMW Motorcycle enthusiasts. Test your Beemer knowledge with our extensive database of trivia…and maybe learn something new. Challenge your friends with our online leaderboard (optional). Submit your own Beemer Trivia through the app. BONUS: For a limited time, reach 2500 “miles” to unlock a promo code for a discounted BMW Motorcycle Magazine subscription. If you enjoy playing the game please consider rating and/or writing a review in iTunes, here.